Authentic Japanese style construction is quite different from what we are used to seeing here in the USA. The first step is to gather lumber, but not at the local lumber yard. The woods that we use are all non-standard, large dimension, that are special ordered direct from sawmills. We use various wood species such as Port Orford Cedar, Alaskan Yellow Cedar, Western Red Cedar, Douglas Fir for framing and finish work. Also difficult to find domestic woods of all types, hardwoods and softwoods, that display extraordinary beauty in shape, size and grain quality for decorative locations as appropriate. With Lumber gathered we begin in the shop custom milling each piece straight and square to specific dimensions dictated by the design and traditional proportioning. The pieces are then marked for location giving careful consideration to proper orientation for strength and visual composition. All of the lengths and cutouts are marked and fabrication begins. The framework in Japanese style is held together by complex joints that lock together with wedges and pins. This jointery is mostly executed with traditional hand tools. Saws, chisels and hand planes. We balance the work load with some power tools for repetitive and non-crucial cuts. In any case we always finish the cuts by hand ensuring that attention is given to all locations maintaining the highest level of quality. When all of the cutting is complete, the exposed wood surfaces are shaved flat and smooth with hand planes. This removes all of the layout marks and leaves a beautiful deep satin finish that no amount of sanding can approach. The wood members are then wrapped in protective paper ready to be delivered to the jobsite. While shopwork takes place, sitework also proceeds. Utilities, driveways, grading all occur and foundations are put in place. Ideally a master site plan has been developed so that any necessary preliminary landscaping such as large rock placement can occur early on. Now the “Tatemai” (frame raising)! With all the basework in place and the materials delivered, we begin the assembly. Imagine a Chinese puzzle the size of a house, built to the quality of a piece of furniture. Step by step the structure begins to take shape. Often the members are quite large, heavy and the surfaces already finished. Moving them requires allot of muscle and a great deal of care. Big mallets and a crane are typical features at a Tatemai. For a house the primary frame up to the ridge is completed. This is called “Mune-age”. Usually a small celebratory ceremony takes place at this milestone. Then the roof is rapidly built to insure weather protection for the frame. On a normal western framed house the finish woodwork is applied last, nailed or stapled over sheetrock. Not so a Japanese house. 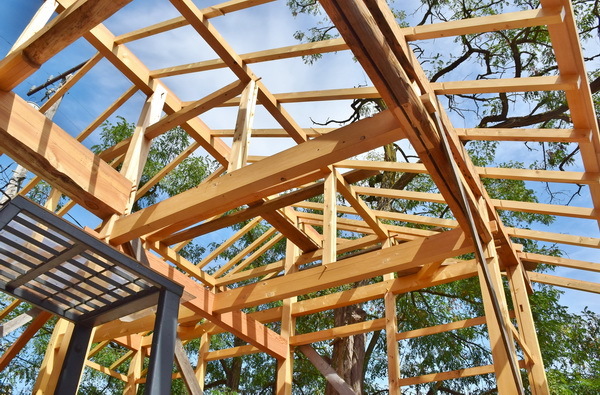 The large solid timbers of the primary frame will be exposed creating the primary wood presence. All other finish wood is notched into and supported by this frame. First window and door jambs are installed, then support for walls attached to the frame and jambs. There are various types of wall systems that can be used. In any case, at least the exterior walls will be completed first, the windows and doors installed, and the building closed in. With the building secure and dry, interior work such as floors, ceilings and cabinets proceeds along with mechanical and electrical installation as normal except that installation of final wall surfaces is last after all of the woodwork is complete. Typically a troweled-on plaster of some sort is used as the wall finish. Applying this last allows for the plaster, which readily conforms to any shape, to fit perfectly to the woodwork ensuring the highest possible quality of finish. Please see more about wall systems on the information link to the right. As the building is being completed, final exterior grading, garden structures, landscape features and plantings can be installed. One final celebration (the final inspection) and a new home is born!